KIC office is close during year change period from December 26th to January 6th. The Konkokyo International Center (KIC) is going to hold Konkokyo Gathering in the UK on June. There will be faith enrichment workshop and religious service. Please come and join us in the UK. Everyone is welcome!! Also, on the 6th, we will hold a meeting with mothers who have small children. Please contact us if you are interested in it. If you know anybody who lives in the UK or other countries in Europe, please let us know at your earliest convenience!! If you have any further questions, please feel free to contact KIC. We have got an invitation of Konko Faith Gatherings in New York which will be held on April 26th and 27th. This invitation came from Rev. Joanne Tolosa, the Head Minister of Konko Church of San Francisco. “Please join us. I look forward to meeting with you! The 4th Konko Missions in Hawaii and Konko Churches in North America Joint Missionary Women’s Society Seminar was held at the Konko Mission of Honolulu, in Hawaii from January 25-27, 2013. The theme of our seminar was, “Revealing the Faith of the Pioneer Ministers: Missionary Women Power!” 「初代の信心を今に現そう：女性パワー！」. There were 19 missionary women plus two male ministers who accompanied their wives on this trip, which included participants from the North America, Hawaii, and Japan. And powerful we are!! We really enjoyed sharing our faith with each other. 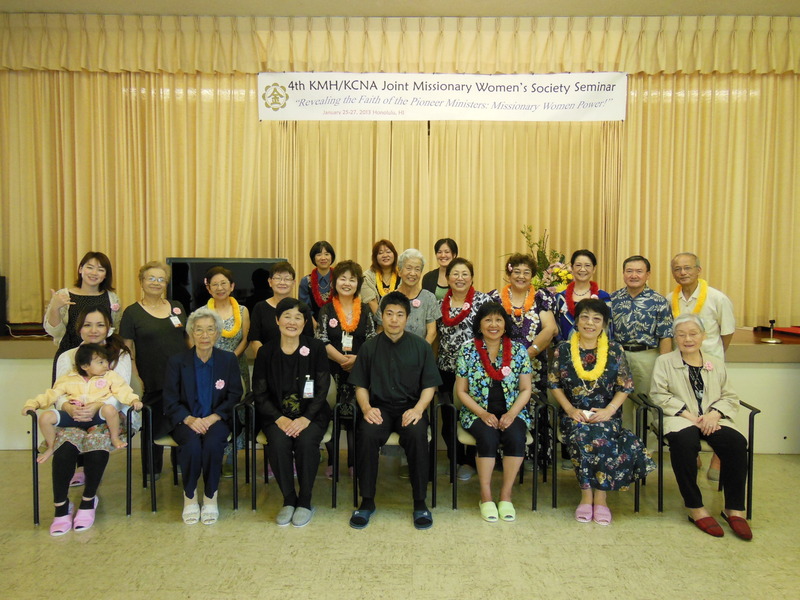 Through this seminar, we truly felt appreciative of the Pioneer women missionaries of Hawaii, North America and Japan. Five presenters shared a 10-min insight on the pioneer missionary women of their choice. Rev. Edna Yano (Wahiawa Church) shared the very first Missionary Women’s Gathering in 1962, along with individual pictures of each sensei and their inspiring stories. During WW2, Rev. Masayuki Kodama (Honolulu Church) was sent to the internment camp and repatriated afterwards to Japan. While in Japan, he went to see Konko-Sama the 3rd to receive guidance. To that, Konko-Sama III replied, “You can pull your family out of Hawaii and return to Japan.” However, his wife, Rev. Kikue Kodama was firm in her conviction to not leave the islands and abandon the church and the many members. Had she agreed to return to Japan, the Konko Missions in Hawaii would not be here today. It was a very critical point of the organization in Hawaii, but all the women missionaries kept the faith firmly and never gave up. Rev. Joanne Tolosa of San Francisco Church shared about the unconditional love and compassion of the Rev. Shinko Fukuda and Rev. Fumiko Matsui. They were always thinking about others, and never complained about any hardships that may occur in life. Their single-heartedness to “Ikigami Konko Daijin-Sama” echoed throughout their prayer. Their love was indescribable—these pioneer missionary women had a heart that was like a mother bird wrapping her wings around her injured child, making the bird feel so warm and secure. Rev. Joanne Tolosa was so touched by this unconditional heart of Kami by the pioneer missionary women, that she too perpetuates this by giving people a warm hug to people who come to receive Toritsugi Mediation. During her presentation, she highlighted the other present-day pioneer ministers among us—Rev. Setsuko Okuno (Hanapepe Church), Rev. Kanako Takeuchi (Chicago Church), Rev. Wakiko Igawa (Whittier Rose-Hill Church), and Revs. Toshio & Yoshiko Ota (Lancaster Church). Rev. Yukari Yasui of the Neyagawa Church, Osaka talked about her mother, who was a school teacher. When she received her salary, she placed the envelope without opening it on the offertory tray. Yukari sensei’s father, who was the head minister, would always say with a smile from the Mediation Desk, “Gokurousama deshita (Thank you for your hard work).” Then he took half the earned income and offered it straight to the Headquarters and other respective churches to give thanks. The other half was used for church and living expenses. Many of us shed tears while listening to her story, as we all have been through these dire financial situations, and received blessings. During Rev. Mayumi Yasutake’s (Waipahu Church) presentation, we were surprised to know that of the 19 participants, 14 were overseas missionary women. Of the 14 women, 11 became ordained from a lay-believer. That is about 80% of the people that participated. We had many group discussions to talk about our faith—even forgetting about breaks that were scheduled in-between. We felt extremely energized to receive everyone’s power. We would like to extend much appreciation to everyone who participated in this seminar, as well as the Konko Mission of Honolulu for being the host of this joint function. We exchanged omiyage gifts with each other—hand-made with so much love. The healthy and delicious meals were cooked and prepared by our wonderful and talented chefs. During Aloha Time, we enjoyed KCNA, KMH and Japan’s skits, songs and game presentations. To top it off, we whacked the Piñata and enjoyed a flurry of confetti and candy. On the last day, we joined the Honolulu Church Monthly Service and received the privilege of being able to listen to three mini-sermons by, Rev. Joanne Tolosa (San Francisco Church), Rev. Toshio Ota (Lancaster Church), and Rev. Masatoshi Shimanaka (Echigawa Church). Our final discussion ended with everyone in high spirits and anticipation to be able to meet each other for the 130th Anniversary of the Founder Konko Daijin’s Spiritual Birthday Grand Service in Okayama, Japan in October of this year. Rev. Joanne Tolosa mentioned an additional wish to be able to hold a joint MWSS with our Brazil, Paraguay, and South Korea counterparts in a global perspective. Finally, it is all of our prayer that we be allowed to attend the 5th Joint KMH/KCNA MWSS in 2018 with North America as host, to continue this faith tradition. Thank you very much. 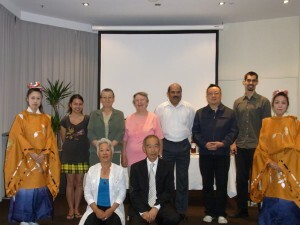 The Konkokyo Faith Gathering will be held in Sydney, Australia. 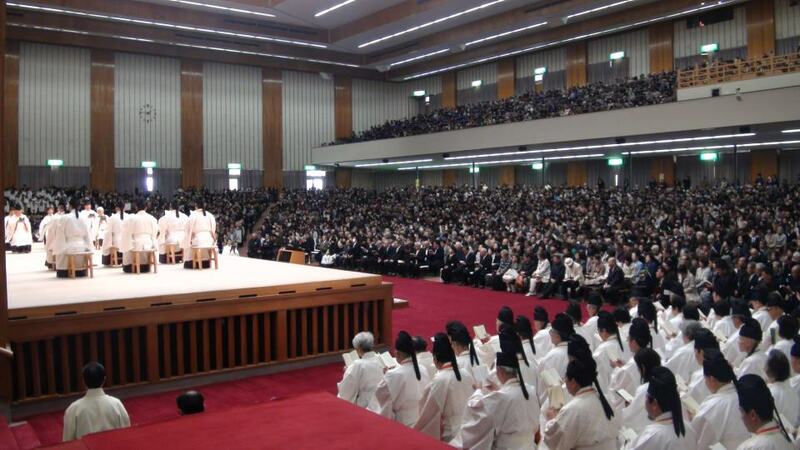 The gathering will be open for Konkokyo believers as well as to those that are interested in the Konko Faith. This time, Reverends Nobuhiro Kusuki and Masafumi Kimoto, Staff Members of KIC, will be at the Faith Gathering. The gathering will be held on Sunday, December 2nd. Please invite your family, friends, and those interested in Japanese culture/religion. On November 30th, a biographical movie of our Founder, “Divine Favor Depends Upon Your Own Heart”, will be screened at Sidney University. We hope you enjoy our gatherings. Time: 13:30 a.m. – 16:00 p.m.